Future engineer. 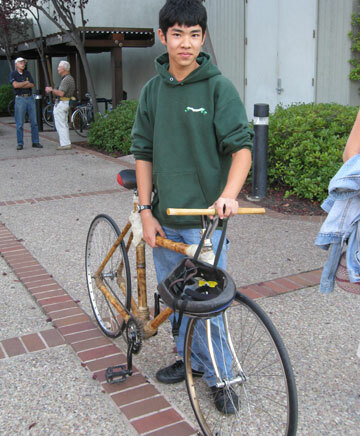 John Xia, a Palo Alto high school graduate, made his own bamboo bike. We’re all familiar with steel, carbon-fiber, and aluminum bike frames, and then there’s bamboo. Classified in the plant world as a grass, you’d never guess as much from its size. Bamboo bikes have been around for a long time, probably since the first bikes were made, but even today they have a following among cycling enthusiasts. One of the better known companies is Calfee Design in Santa Cruz, Calif. Many cycling names have come out of Santa Cruz, including Craig Calfee, Jim Gentes (Giro helmets),and Keith Bontrager (mtn bikes and equipment). Craig’s company has been building bamboo bicycles since 2005. He has also traveled to Ghana to show people how to build bamboo bicycles. Craig was one of the original builders of carbon-fiber bikes in 1989. In 1991, Greg LeMond contracted with Craig’s business to have his team supplied with carbon-fiber frames. Craig continues to sell carbon-fiber frames today. Equally important, he’s one of the few suppliers in the region who repairs carbon-fiber frames. I’ve never ridden a bamboo bicycle, but I can imagine it gives a smooth ride, much as the Vitus aluminum bicycles of the 1980s. Are these frames going to last as long as steel? I’m not going to hazard a guess, but rest assured termites won’t bother them, since the tubes are coated with polyurethane. If you want a bamboo bike, you can build your own and save some money. Another company that has just started selling bamboo bikes is Panda Bicycles, based in Fort Collins, Colorado. I’m not sure they’re in full production, but they have a website. This entry was posted on May 17, 2010 at 8:34 pm and is filed under Products. You can follow any responses to this entry through the RSS 2.0 feed. You can leave a response, or trackback from your own site. I worked at Calfee Design, then called Carbonframes in 1995 and we had a bamboo bike there then. It rode really nice. The young man with the bamboo bike in the photo you posted last year is named John Xia. He now goes to the University of Chicago.